The Best Way to Handle Suffering is to EAT it ! We all feel acquainted enough with suffering to fancy ourselves authorities on the subject. Certainly, whether we admit it or not, we mingle much of the suffering in our lives with equal parts resentment, bitterness, anger, and whining. In fact, we often add cries of injustice as a frosting to this exercise in self. Look, I do not pretend for a second that many people have not experienced more than their fair share of terrible suffering, injustice, and pain. Neither do I dare ignore the fact that many people seem to fall from one misfortune to another while others seemingly dance through life like privileged elites immune to tears and fears. I have an aunt, for example, whose life has been nothing but a series of illnesses, bad breaks, and unfair results. She ended up in a wheelchair at an early age and things have only gotten worse since then, leaving her practically blind today as well. The reality is that people experience different kinds and levels of suffering, completely independent of their relative goodness, innocence, fault, or success. Some already happy, healthy, and successful people never seem to suffer; while many depressed, unhealthy, and unlucky folks seem to only receive more suffering on top of their present struggles. Saints certainly do not have a get-out-of –jail card when it comes to suffering. Most of them experienced one difficulty after another, a litany of misfortunes, and enough unfairness to last a few lifetimes. The fact that being closer to God often only means suffering more than others only adds to this whole perception of suffering as random unfairness inflicted on us by a God munching on popcorn while we cry. It is at this point, when we are almost ready to toss up our hands in disgust and refuse to participate any further in this seemingly twisted game of pain, however, that we need to pause, take a reality check, and get a grip. 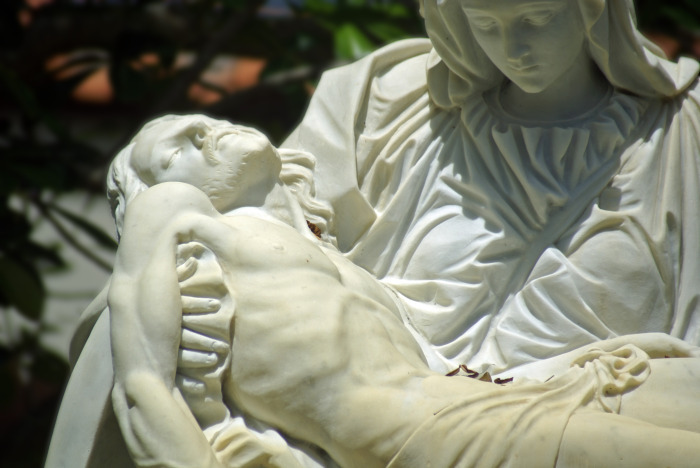 First, let us consider that Our Lord, the most innocent and faultless person that ever lived, suffered far more than any human ever will, for sins He did not commit, at the hands and accusations of people steeped in sin themselves. Second, note that Christ did not let this stupendous injustice deter Him from exhibiting forgiveness, kindness, and compassion toward even those who caused His suffering. Finally, and perhaps most importantly, realize that Our Lord provided us with the most powerful and effective strategy for transcending suffering, and even using it as a vehicle for sanctification and salvation. Simply stated, and promoted by such greats of our Faith as St. Alphonsus Liguori, that strategy is to EAT the suffering in our lives. E………….First, we must embrace whatever suffering comes our way just as Christ embraced His cross. Anne Catherine Emmerich, the great mystic, even wrote that Our Lord kissed His cross upon receiving it. Being a Christian means following Christ, and following Christ means following Him as we carry our relatively small crosses. We cannot carry our crosses if we do not embrace them upon receiving them. We can never accept something unless we first embrace it and hold it. In the context of suffering, then, we must first pick up our crosses and embrace them if we pretend to emulate He who willingly embraced His cross. Embracing in this context is more the physical and actual interaction with the suffering that faces us. The cancer patient who follows the doctor’s orders and undergoes the numerous tests and procedures instead of sitting home avoiding what is necessary to do is a prime example of someone who is embracing suffering rather than avoiding it. A…………Second, we must move beyond merely embracing our suffering and learn to accept it. Embracing and accepting in this context do not mean the same thing. Simon embraced Christ’s cross, but unwillingly at first. St. Catherine Emmerich tells us that, as Simon connected with Who Christ was and what He was doing, he came to feel compassion for Him and more willingly embraced the task he had initially accepted by force. When the above cancer patient moves beyond merely undergoing tests to refraining from crying “Why me” or cursing at everyone in sight, acceptance has begun. T…………Once we have truly embraced and accepted the suffering that comes our way, out of a desire to please God or avoid offending Him, we need to move to the next and final phase in confronting suffering with an eye toward Heaven. In order to sanctify our suffering, we must transform that suffering from a bad thing we tolerate into a good thing we relish. No, I have not lost my mind, but if we do not take this final step we may well lose our chance to use our earthly sufferings as the steps toward Heaven. Embracing suffering is akin to willingly going to a drug store, buying, and then drinking unpleasant medicine. It is an external compliance, acknowledgement, and consent to the need to take that medicine, regardless of how unpleasant that medicine may be. Accepting that suffering, however, goes beyond that. It occurs when we internalize the external compliance and move from merely going through the motions to avoid trouble, criticism, or looking bad. This is akin to taking the unpleasant medicine regularly as prescribed because we turn the task into a desired habit toward the goal of becoming better. Likewise, when we internalize suffering and see it as a chance for grace and sanctification, we have begun to accept that suffering as something useful, albeit unpleasant, which is better than bitterly cursing it. The final, and most important step, however, is when we transform suffering from something unpleasant we tolerate for a purpose into something blessed and privileged that we relish as a gift from God. You heard it right, suffering in this world is a gift from God that few ever embrace, accept, much less transform. The secret to transforming suffering from a tolerated unpleasant chore into a relished pleasant blessing is not to be found in human nature or experience, for our weak and superficial humanity is incapable of ever truly rejoicing in the face of pain, suffering, misfortune, or mistreatment. In fact, human nature dictates just the opposite and, more often than not, suggests that we gripe, curse, blame, play the victim card, experience envy, or seek revenge. Sadly, human nature would have us lose whatever graces we may have been able to scrape from tolerating suffering for the sake of our eternal salvation. Few of us, if any, have the dedication, strength, and resolve to tolerate unpleasantness for so long and for such a wavering reason. How then, did the saints do it? Was it because they possessed some supernatural, inner gift that we are incapable of finding within ourselves? Gladly, the answer is that we each possess the secret strategy to follow in the steps of the saints to transform suffering from a tolerated unpleasant thing into a desired blessing. As described by Alphonsus Liguori and Fulton Sheen, the secret is to simply accept everything, good and bad, that happens in your life as coming from God for a purpose perhaps only known to Him which is consistent with your salvation and mission in life. More often than not our gripes, complaints, and distaste for suffering come from seeing it from our own temporary, temporal, and personal perspective. However, if we view suffering and misfortune as coming from God for God’s ultimate purpose and truly love and trust God as always doing what is right by us, then we will obtain greater peace, contentment, patience, and solace than ever possible on our own terms! Even Our Lord allowed His humanity to pause in the face of suffering, going as far as asking if the cup reserved for Him could be avoided. However, Our Lord, and countless saints after Him, ultimately viewed suffering, not as an unpleasant chore to be tolerated for the sake of avoiding evil but, much more pleasantly and powerfully, as a blessed opportunity for following the Will of God, as Our Lord exemplified at Gethsamane and Calvary. For us mere mortals, moreover, suffering in this world should rightly be seen as a chance to pay the debt of our sins in this life rather than in eternity where, if we play our cards right, we will enjoy the rewards of loyalty and dedication to God. Thus, it is true that the secret to turning suffering into a blessing is to EAT that suffering. Ultimately, suffering will move us farther from God if it becomes about us and closer to God if we turn it into all about following God’s Will.